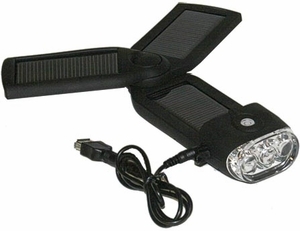 This compact solar charger is a great camp mate. With a USB outbound charger, it's capable of charging most USB compatible devices, including iPods, cameras, and cell phones. Plug your own cable into the outbound charging socket to charge your GPS and other devices. A built-in 3-function light has 2 flashlight settings and 1 strobe setting. An easy-grip exterior rubberized coating is shock-resistant too. 15 hours of flashlight use on full charge. 65000 mcd light. 5.5 volt output voltage. 200 mA current output.